Fourcroya Spreng., Anleit. Kenntn. Gew., ed. 2, 2(1): 238. 1817, orth. var. Ventenat, É.P., 1793: Bulletin des Sciences, par la Société Philomatique, 1: 65. Govaerts, R. et al. 2012. Furcraea in World Checklist of Selected Plant Families. The Board of Trustees of the Royal Botanic Gardens, Kew. Published on the internet. Accessed: 2012 Dec. 30. Tropicos.org 2012. Furcraea . Missouri Botanical Garden. Published on the internet. Accessed: 2012 Dec. 30.
International Plant Names Index. 2012. Furcraea. Published online. Accessed 30. Dec. 2012. 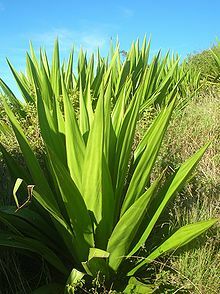 For more multimedia, look at Furcraea on Wikimedia Commons.